Volunteering is a great way to meet new people, learn new skills and gain a deeper appreciation for what goes on behind the scenes of a major event like the Albuquerque International Hot Air Balloon Fiesta. Most of the work, from checking in guests at the RV park to helping launch and recover balloons, was done by volunteers and with an event this big, there’s always a need for more, as my wife and I discovered during our first evening at the Balloon Fiesta. Just inside the main entrance to the balloon launch field was a kiosk with a huge sign that read, “Volunteers”. That tweaked our curiosity. The person behind the counter explained that the greatest need was for balloon support team members. Launching and recovering a hot air balloon was a labour intensive process. Even the smaller, non-commercial, sport balloons required a support crew of 3 or 4 plus the pilot. Larger balloons need many more. 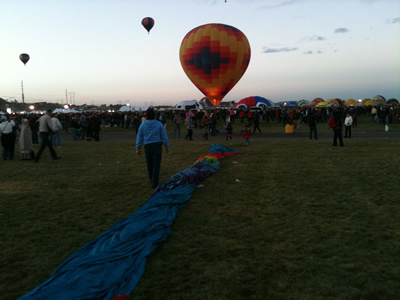 Most amateur balloon pilots couldn’t afford to bring that many people to an event like the Balloon Fiesta so they depended on volunteers for help. The thought of helping to launch and recover a hot air balloon sounded incredibly exciting so wife and I took the plunge and signed up to help on Sunday morning, the last day of the Balloon Fiesta. We were assigned to a balloon pilot from Tennessee and given a time and place to meet on the launch field for the “Mass Ascension” (when all the balloons were launched). Sunday morning before dawn, Maureen and I arrived at the designated location on the launch field, eager to meet our pilot and begin our adventure. All around us, other teams were arriving and preparing their balloons for flight yet our spot remained empty. I started to worry. Were we at the wrong place? Did we misunderstand our instructions? Had we overlooked or missed something? Finally, after what seemed like an eternity, Maureen and I wandered over to a group nearby who had recently arrived and asked if they knew anything about our missing pilot? Indeed they did. Due to an emergency, he had returned home. We were devastated. Gone was our pilot and our dreams of adventure. The person we were talking to must have noticed the look of disappointment on our faces because a smile lit up his. If we were still interested in volunteering, we were welcome to join his crew. The “his” in this case was a pilot named Michael Hill from Denver Colorado. On his crew was Michael’s wife, a good friend who was his crew chief, the crew chief’s wife and daughter plus another volunteer. That seemed like a lot of people for one crew. Was Michael just being nice? Did he really need or want a couple of newbies? As it turned out, he did which was the reason for his smile. The crew chief’s wife and daughter were reluctant participants, pitching in only because there was no one else to help. After getting up before dawn on several previous mornings, they had had enough. When they heard we were willing to take their places, they thanked us profusely then “high-tailed it” back to their hotel room and warm beds. We were officially part of the crew and about to learn the art and science of hot air ballooning. Our education began with the discovery that balloons were a lot bigger and heavier than they look. The envelope (the round fabric part that’s holds the hot air) of a private sports balloon like Michael’s was taller than a three story building and wider than a house when inflated. Even though the envelope was made from a light weight, heat resistant material, it took a LOT of material to make the envelope – over two hundred pounds worth! Our first job was to haul the envelope out of the equipment trailer, remove it from a protective canvas bag and lay it out on the ground. The pilot and crew chief then checked all the lines and ropes to ensure nothing was tangled. Next came the inflation. 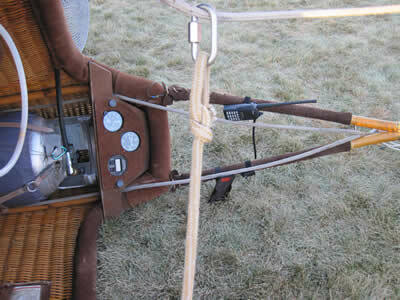 The bottom of the balloon, called the “throat”, was held open by two people (my wife and I) while a third person fired up a large, gas engine powered fan that would inflate the balloon with cold air to about 2/3’s its normal size. As the balloon filled, the pilot walked around inside inspecting the interior for heat damage and checking the position of a huge round piece of fabric called the “parachute” which covered a large opening at the top of the balloon. By manipulating the “parachute” in flight, the pilot could release hot air to descend and land however, if the “parachute” was not properly positioned during inflation, the envelope will not inflate correctly. Once the inside checks were made, the basket was hauled out of the equipment trailer and attached. Even in the 21st Century, with a host of modern materials available, most hot air balloon baskets are still made from wicker. Once again, while wicker is generally considered to be light, a LOT of it is needed to make a basket - approximately 200 pounds worth. Into the basket went the propane tanks along with other gear, instruments and equipment. If hot air balloon baskets were old school, the propane tanks were definitely high-tech and bore little resemblance to the containers used by typical back yard barbecues. Above the basket, the two propane burners were attached. They created the hot air needed for lift. The burners and propane tanks were then carefully connected with aviation grade propane hoses. Most balloon fatalities have been caused by propane malfunctions so Michael took great care to ensure that his system was connected correctly and working properly. 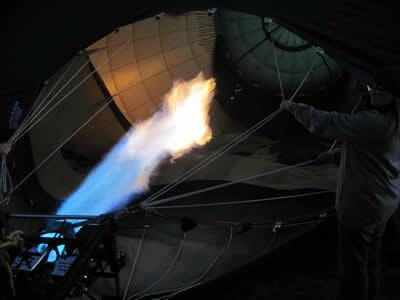 Once the balloon had reached its maximum cold air inflation limit, Michael lit the propane burners and began filling the envelope with hot air. Great tongues of fire leaped from the burners through the throat into the envelope’s interior. While spectacular to watch, it was tricky to execute. Not enough hot air and the balloon would flop around on the ground, potentially causing damage. 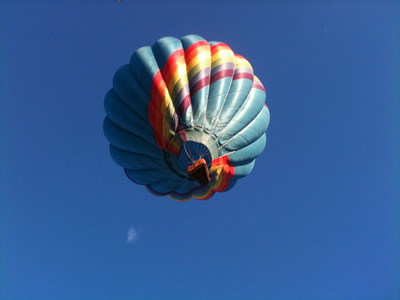 Too much hot air and the balloon would lift prematurely before the pilot and crew are ready. This was obviously not Michael’s first fiesta for in no time, the balloon was standing upright, ready to fly. At this point, Michael apologized. Normally, he would have taken one of us with him on the flight as his way of saying thanks for our help. Today however, was the last day of the Balloon Fiesta and he had promised the flight to his wife. 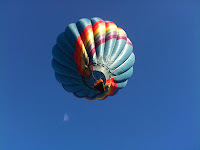 She had been travelling with him all summer to a number of different hot air balloon festivals without once going aloft. Today was her day. We understood. Having been married for more than 40 years, we knew that domestic bliss trumped volunteer thanks every time. Besides we had already booked a flight with one of the commercial balloon operators for the following day (The topic of the third installment) so we weren’t exactly suffering. Michael and his wife climbed into the basket and seemed ready to go – except for one small detail. Michael needed clearance from an FAA controller. That’s right, just like a regular airport, the Balloon Fiesta had its own air traffic controllers who regulated and controlled balloon launches. No balloon could takeoff without a controller’s approval. Just like their airport colleagues, the controller’s job was to ensure that balloons did not collide during takeoff. Unlike their airport colleagues, these controllers didn’t sit in a control tower. Instead, they walked around on the field, coordinated with other controllers and controlled the takeoffs from a particular section of the launch field. Luckily, it wasn’t long before clearance was given and with a huge whish of flame, the balloon lifted skyward. Michael and his wife were off. While it was a beautiful sight to behold, especially with all the other balloons lifting off around us, we had little time for sightseeing. It was back to work. 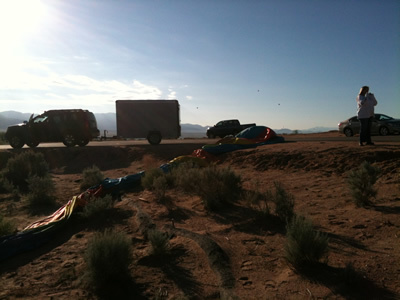 We quickly packed the remaining gear into the equipment trailer, piled into the chase vehicle and headed for the exit. By now, I had completely lost track of Michael’s balloon. With hundreds of other craft filling the sky, many with a similar colour scheme it was virtually impossible to follow just one balloon - at least for me. My wife thought she could see it but wasn’t sure. The crew chief on the other hand had no trouble tracking Michael - while driving the chase vehicle and maneuvering through city traffic! In the passenger seat, the other volunteer was scanning an area map and plotting the best route to keep up. 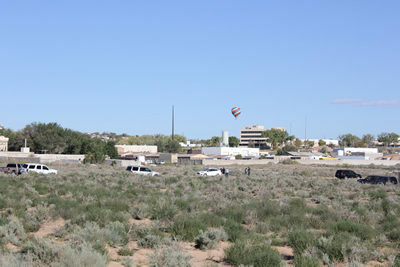 As we headed out of town, some of the earlier balloons were already landing. One came down in a mall parking lot, beside the road we were drove by. Another came down in a nearby school playground while a third landed on an adjacent sports field. As my wife and I looked on in disbelief, our two companions in the front took no notice. Apparently this sort of thing was commonplace in their world. Instead, their focus remained on Michael’s balloon and keeping it in sight. In addition to visual contact, a connection was also maintained via two-way radio. As we headed out of town, Michael and the crew chief discussed various landing site options. Finally it was decided that a dry riverbed on the northern edge of town would make a good touchdown spot. Before long, we were parked beside an open sagebrush covered area that was relatively flat except for a steep, 100 foot high bank to the south. While we waited, a woman walking her dog warned us to be careful. A rattlesnake had been recently spotted in the area. As we digested that “delightful” news, a balloon (not Michael’s) descended from the sky and came in for a landing. Unfortunately, the pilot misjudged his approach and instead of setting down on the flat area, overshot and slammed into the steep bank. Thankfully, no one was hurt but the crew chief turned to us and muttered, “They’ll have a hell of time packing that out.” I don’t think Maureen or I understood what he meant until we realized that the only way to retrieve all the balloon equipment was by packing it up the bank. Remembering that the envelope, basket and burner system all weighed around 200 pounds apiece, we were immensely grateful not to be part of that team. Just then, Michael’s balloon came into view. Slowly and surely, he began his decent and, unlike the previous pilot, touched down dead center in the open area. It was a textbook touchdown until a sudden gust of wind toppled the balloon and basket, dragging both along on the ground. “Grab something!” yelled the crew chief as we all ran forward to help. As suddenly as it began, the gust was gone and the balloon came to a stop. Michael and his wife emerged from the basket, a little shaken but otherwise, none the worse for wear. As we helped them out, the crew chief and the other volunteer were busily expelling the remaining hot air from the envelope. A few minutes more and the envelope was deflated, neatly folded, rolled up and ready for storage in the canvas carrying bag. As the landing area was flat, it was easy to drive the chase vehicle and equipment trailer right up to all the gear and load it onboard. No packing heavy stuff up steep slopes for us. Oh, The Stories We'll Tell! On the way back to the field Michael and his wife thanked us for our help. They really appreciated our efforts and hoped we had a good time, even though it hadn’t included a balloon ride. The crew chief thanked us as well. He could now drive home with a wife and daughter who were well rested and happy, not sleep deprived and cranky. And, we thanked all of them for taking us in as team members and including us in an amazing adventure. We had the time of our lives plus an incredible story to tell our friends, relations, family members and especially our grand-kids - about the day Mimi and Grandpa went to the Albuquerque Hot Air Balloon Fiesta and helped Michael Hill fly his beautiful blue hot air balloon. What could top that! In the third and final installment, I’ll share the amazing story of our flight in a hot air balloon plus the challenges we faced to make it happen. You won’t want to miss that.